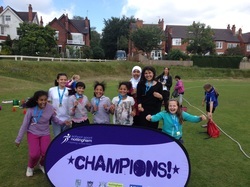 Congratulations to the girls' cricket team for winning one of the city's finals competitions, meaning that we progress to the County finals on July 3rd. The girls competed against Southwark in two closely fought games. We came out on top and now face 15 other schools from around the county! Meanwhile, in the morning, the boys team came fourth after two very narrow defeats against the 2nd and 3rd place teams. In one match, we scored a whopping 291 runs - the highest score of the day! Look below for photos and video from the two city finals.